For the first time in 20 years, Paul McCartney performed in the city of Pittsburgh, christening the Consol Energy Center with a three-hour performance on Wednesday night. The 68-year-old Beatle started with "Venus and Mars/Rock Show" and went right into "Jet", in a set that totaled a whopping 39 songs in all, with 22 coming from the Beatles' catalog. 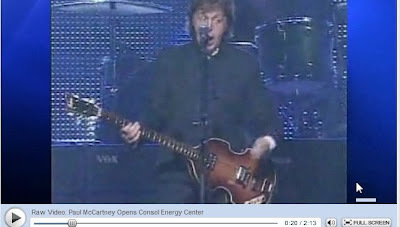 After gates opened at 6 p.m., McCartney took the stage at 8:23, "fashionably late" according to the PG's Scott Mervis, who added that the Consol Center "passed its first test as a concert venue", accommodating McCartney's massive video screens. WPXI has raw video from the new arena's first event, which you can view by clicking here. 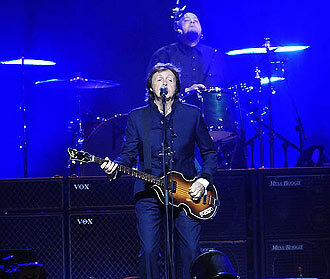 McCartney will play a second show on Thursday night, with the next concert at the CEC being Lady Gaga on September 5. The Penguins' first home preseason game comes Wednesday, September 22 against the Red Wings. Eh, McCartney's not for me, but THANK GOD lady googoo didn't get to christen the Consol Energy Center. By all accounts a huge success though! It's bad enough that the backstreet boys opened Heinz Field. The Pens did it right again.